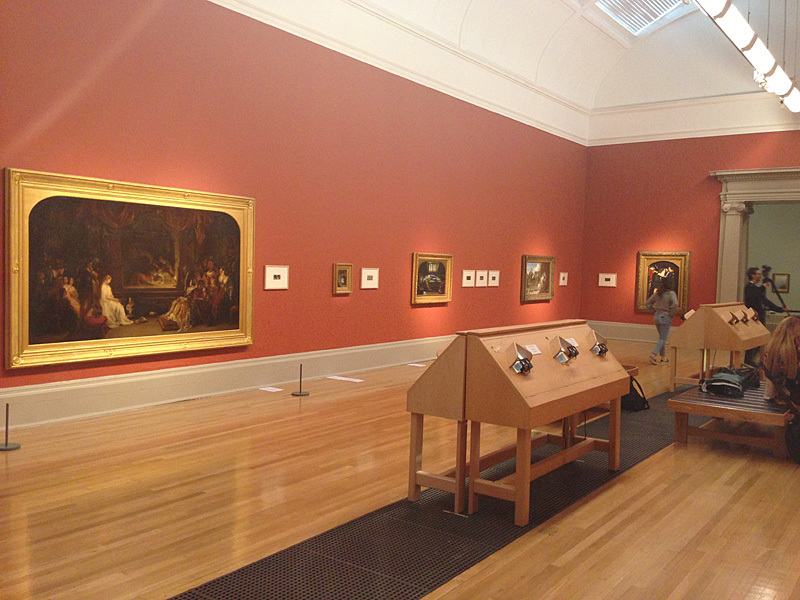 We urge you to come to Tate Britain to see – LIVE – the display that accompanies our book The Poor Man’s Picture Gallery. The display wil be there for six months, or maybe more, but you know how time flies ! Just to avoid confusion, this is not the Tate Modern, which can be found on the South Bank. 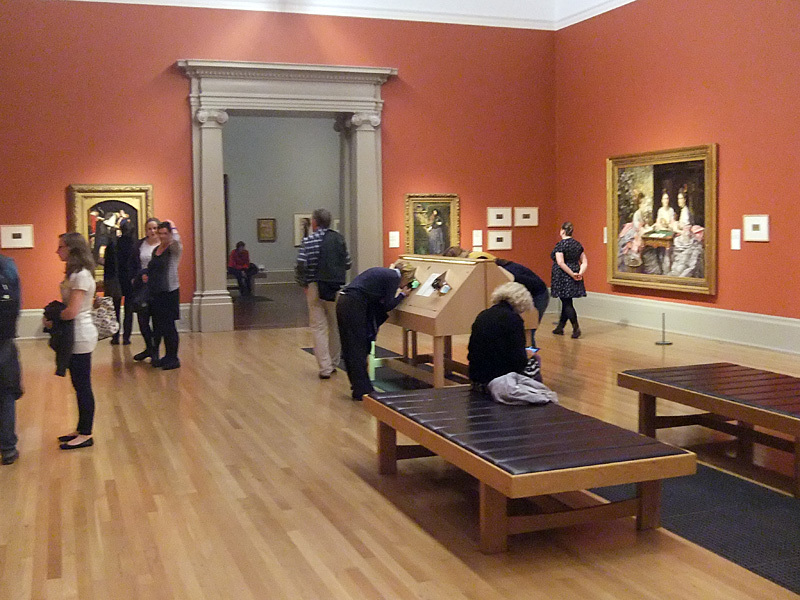 Tate Britain is situated on the North side of the Thames, on Millbank. Yes – it used to be called simply “The Tate Gallery” ! It’s the one with lots of beautiful Victorian Paintings, including Freddie’s favourite – The Fairy Feller’s Masterstroke by Richard Dadd – inspiration for a Queen song. 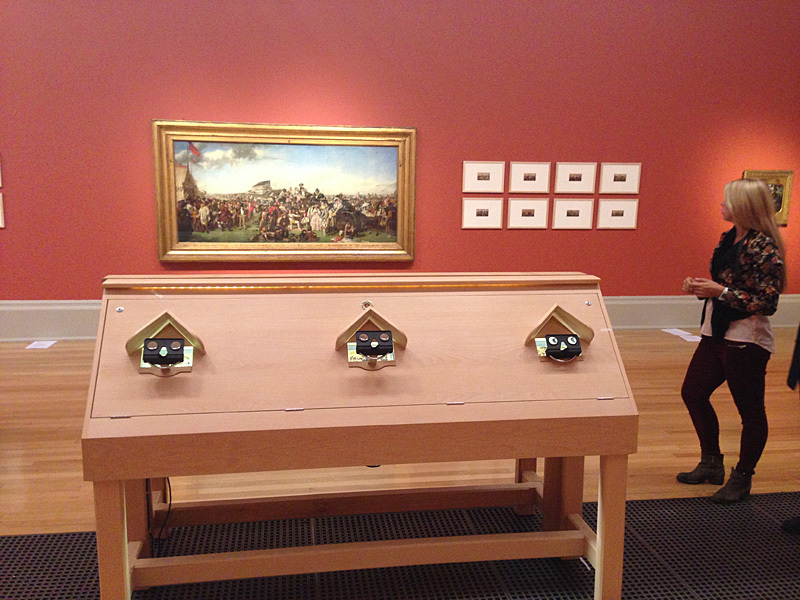 For the first time in its history, the Tate Gallery is displaying Stereo Cards. And the Display has been allotted its own room, freshly painted in a warm and very pleasant rust colour. There are paintings hanging on the walls (some of them have not been on display for years and we were thrilled to see them for the first time) and, next to them, are framed stereo photographs that were inspired by the paintings or, in two cases, seem to have inspired them. 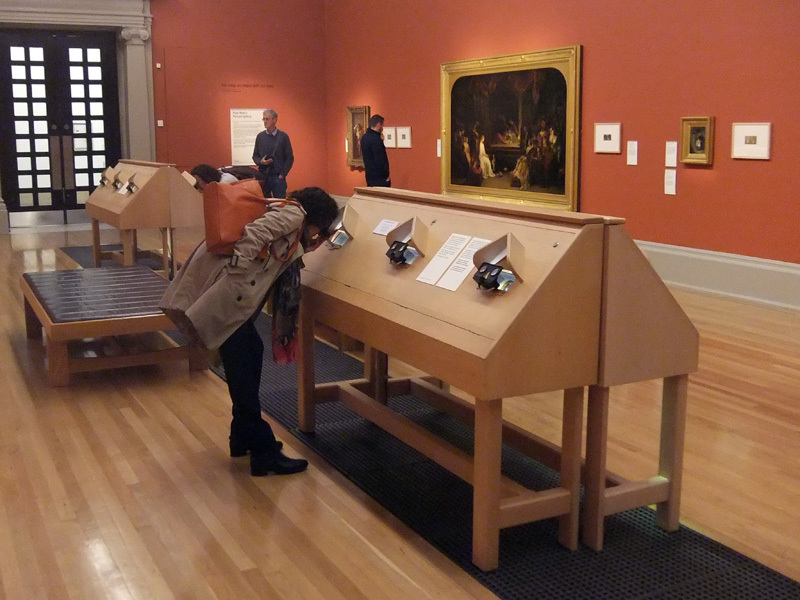 But the key to the whole experience is on the middle of the room, where there is a group of stereoscopic cabinets (see the photograph) that enable you to see twelve stereo cards in glorious 3-D – exactly as the Victorians enjoyed stereoscopy. 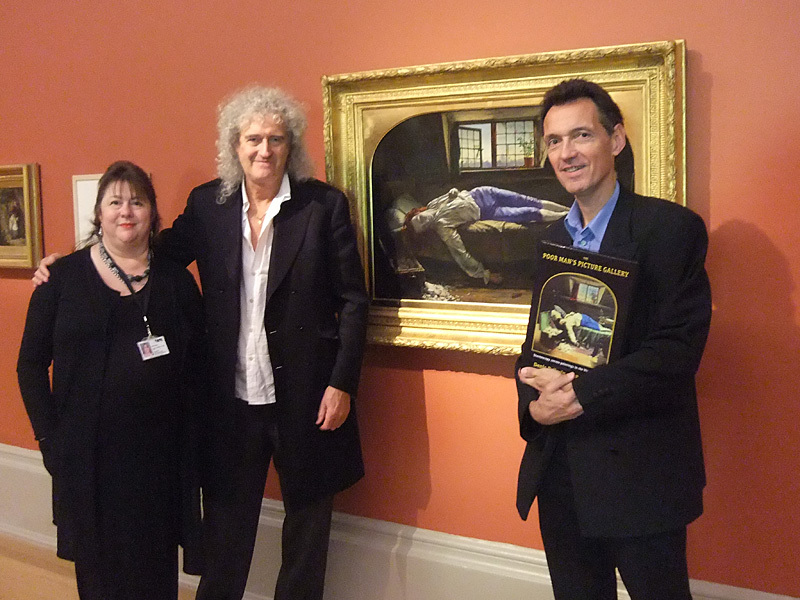 Each of the photos has been placed within sight of the painting it relates to. Sometimes you might have to cast your eyes around a little to see the corresponding canvas, but it will not be far away. The stereoscopes can all be focused. Just pull or push the handle underneath the lens panel, let your eyes relax and look through the lenses. It may take a few seconds for the 3-D picture to appear, but when it does, you will totally understand why we wanted to share this magic, first-hand. 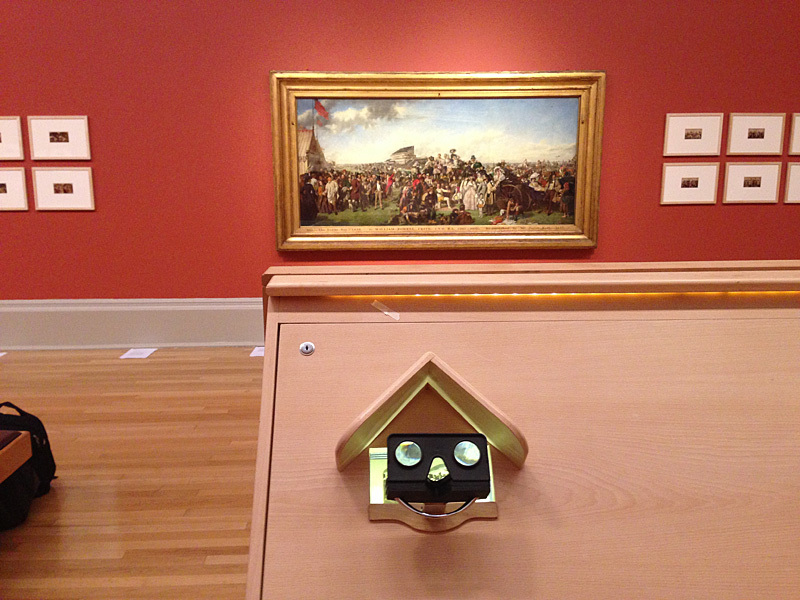 There is some explanatory text for each scene, but for the full stories that connect the paintings with the stereographs, you will need the book that inspired the exhibition – The Poor Man’s Picture Gallery, which includes an OWL stereoscope for full 3-D experience ! These stereo tableaux became a huge craze for Victorians, and were sometimes dismissively referred to in the 1850s as the Poor Man’s Picture Gallery. Original paintings by famous artists were effectively out of reach for the general public, though some of them could afford the high price of an engraved reproduction. But for 1 shilling and 6 pence, or sometimes less, anyone could take home a tinted photograph that reproduced the scene, in what we would now call 3-D, using real people in real ‘sets’. At home, through the magic of the stereoscope, they could then examine every detail in these stereo cards, and share their impressions with their friends and family. Of course in those days there was no radio, no record-player, no cinema, no television, no phone, no Internet. Middle class Victorians entertained their guests after dinner with a stereoscope and a stack of stereo cards, sharing with them the latest stereoscopic gems. This is the experience we would like you to discover at the Tate display. Linger with the paintings, enjoying every detail; connect with the faces of the characters, and their emotions There are many stories here, some well-known, like the Play-Scene in Hamlet, some less well-known, but equally fascinating. Then, one by one, take in the immersive experience of the stereo images, featuring real people captured in a moment in time, in the Victorian equivalent of Virtual Reality. It could be the new craze !